Next: ARE PRIVILEGE PARTIES THE NEXT BIG THING? 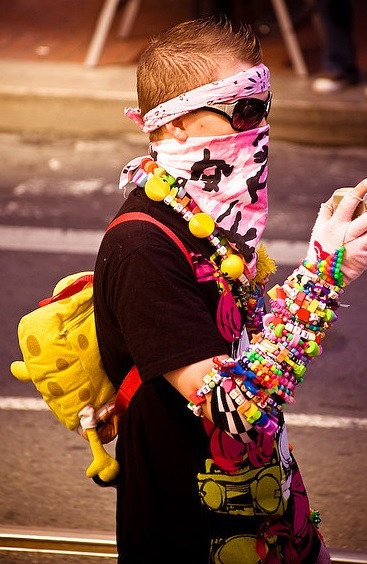 A disturbing trend has Montreal police warning the elderly to be on the look out for ravers. “We’ve noticed a surge of carjackings against older citizens,” says Sgt. Mary Bunswick of the SPVM. “The culprits in each case were described as young party goers who wore brightly coloured fun fur pants. Many of them sported plastic bead bracelets and some were sucking on pacifiers." Ravers are baffled by the allegations that members of their community are engaging in carjackings. “First, who the hell dresses up like that anymore?” asks Leelee Leroux, a 21 year old EDM fanatic. “The only ravers who still wear fun fur pants are the elderly. That is so 1998. I don’t think people are being targeted by genuine ravers, instead I think they’re being targeted by people who want to make ravers look bad. This is a sabotage campaign. We’re being blind from crimes we didn’t commit. Next thing you know, the city will be cracking down on parties again in the name of public safety. It’s a giant false flag operation." Criminologist Ludwig Vanderbeek disagrees. “Why would anyone go out of their way to make ravers look bad? They already look bad.” says Ludwig. “I believe these carjackings are the result of today’s small rave culture cracking under their own insignificance. Most people don’t even know that raves still exist. Stealing cars from the elderly is their way of reminding society that raving is still alive, it’s still subversive, it’s still a force in society." Party promoter Kyle Berlin says that ravers have never been concerned with popularity. “Most of us just want to party in peace,” says Kyle. “We don’t care if the rest of society has no idea that raving is still a thing. Hell, we prefer it that way. We don’t want to bring attention to ourselves, we enjoy obscurity. These days, it’s a lot easier to throw an illegal party in Montreal, and that’s because police don’t pay any attention to us anymore. Thanks to these fun fur carjackers, that’s going to change."